Hospitals charge new parents for “skin to skin” contact. As a practicing OB-GYN physician in the Bay Area, I’m no stranger to the holistic birth movement. From being asked to cut the umbilical cord over a block of obsidian to being sprinkled with glitter as the baby emerged, I’ve seen it all. But one of these practices, known as skin-to-skin, has become the norm throughout most of the United States: It’s now conventional practice in many hospitals to try to get the naked babe up on your or your partner’s naked chest ASAP after birth in an effort to increase bonding and encourage breast-feeding, among other things. It’s loving, natural, and—as we now know thanks to Reddit—costly in some hospitals. Earlier this week, a father uploaded his family’s hospital bill for his child’s recent cesarean delivery. 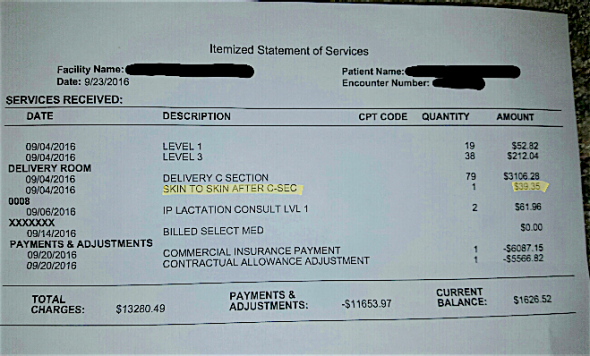 The reason the bill went viral: an itemized listing for “Skin to skin after C-section: $39.35.” (“Quantity: 1.”) Yes, this new dad had to pay money “to hold my baby after he was born,” as he put it. As a mother myself, this seems nuts. As an obstetrician, I guess I can kind of rationalize it. Hospitals have encouraged immediate skin-to-skin after vaginal deliveries longer than they have offered it after C-sections. Doing it while the mother lies cut open on the operating table requires an extra labor and delivery nurse on hand to ensure the immobilized and often drugged-up patient doesn’t accidentally drop the baby onto the floor or smother him or her among the surgical drapes. It sounds silly, perhaps, but it’s a valid precaution. The point of the extra nurse in the room is to help the parents perform this bonding act in a situation wherein it would normally never be allowed. Remember, this is the operating room: a sterile zone for performing surgery. 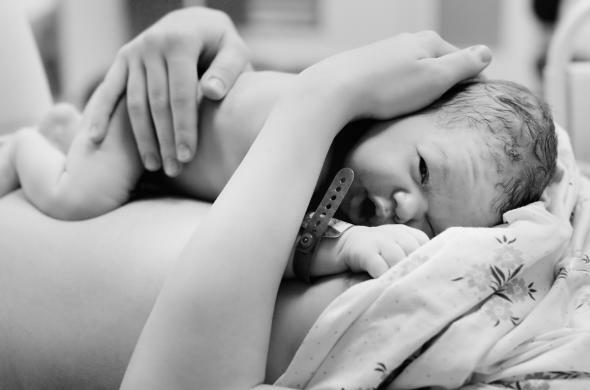 Skin-to-skin under anesthesia is pretty groundbreaking. So I can understand that extra labor means an extra hospital charge. Let’s be honest though—listing it as a billable item seems like a PR disaster, no? Filled with mixed emotions, I looked back at my own hospital bill from the C-section birth of my daughter in 2014 to see if I, too, had been charged to nakedly bond with my infant. Among an overwhelming list of charges, there was no skin-to-skin charge. That means they either don’t charge at my hospital or they know how bad it would look to list it outright and hid the charge elsewhere. My bill totaled around $99,000 (all of which was paid by insurance), but to be fair, I had a lot of medical complications, including surgery and expensive CT scans, to name a few. When you’re paying that much to give birth, what’s another $39.35 to touch the baby? For all I noticed, they might have thrown in a baby-naming fee or surge pricing à la Uber, like if your baby is born during peak delivery hours. To put this all into perspective, my own birth in the early 1980s cost only $1,207.43. (My mother has a special knack for numbers and has always loved pointing that out that my birth price correlated exactly to my father’s birthdate: 12/07/43.) If that’s not inflation, I don’t know what is. But we can be certain of one thing: Back then there sure weren’t any “hippie charges,” as my parents would put it.